A rich, indulgent blend of dried rosehip and apple with hibiscus, ginger and citrus peel. If you’re a fan of mulled wine, this spicey infusion is winter in one cup. Add hot water just off the boil and brew for 3-5 minutes until bright red in colour. An alternative to tea with a bold tang and wonderful, festive feel. This rich and indulgent blend of Christmas flavours is the perfect alcohol-free alternative to mulled wine. With dried rosehip, apple, hibiscus, ginger and citrus peel, this drink is Christmas captured in a mug. 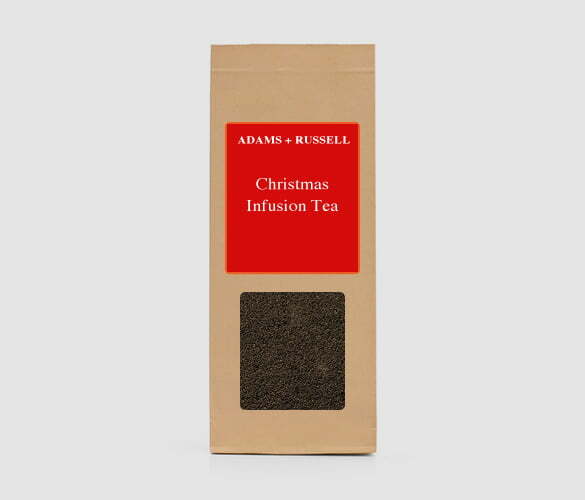 Just add hot water and experience the room fill with festive aromas, which are almost as delicious as the infusion itself. An infusion is placing tea leaves or herbs into hot water to brew a beverage. The most popular infusion is tea, however there are lots of other infusions that don’t require any tea leaves. Infusions can have many different flavours and characteristics. It is all down to the ingredients of the infusion, which could be herbs, spices, seasoning and more. Our infusion is simply dried apple and rosehip, hibiscus, ginger and citrus peel. This gives a delightful tang and an endearing festive aroma. Tea vs. Infusion – What is the difference? The main and most noticeable difference is that an infusion does not contain the Camellia Sinensis plant. Herbal teas are not to be confused with infusions, as these contain the plant. A true infusion will not contain any tea leaves. Infusions can be very beneficial to your health depending on the ingredients. What are the Health Benefits of this Infusion? It is naturally caffeine free, which is great for those who have a bad reaction to caffeine. Studies have shown it can lower blood pressure and cholesterol levels. Some research has shown that it can boost your metabolism which can help you lose weight. The compounds it contains called anthocyanins can improve the health of your heart. The vitamin C content in Rosehip is a great way to give your immune system a boost. Can help to regulate blood sugar levels, which is important for anyone suffering with diabetes. The astringent characteristics of rosehip can help keep skin looking younger for longer. It is also a great aid for digestion because of the acid content. Ginger works to fight against the nausea of morning sickness that pregnant women experience. It will soothe your muscles and help to take away soreness after a long day. Gingerol, which is found in fresh Ginger, can help lower your risk of infections. A convenient way to tick someone off your Christmas list this year is the Adams and Russell’s Tea Gift Set, which is a special way to treat the tea lover in your life. The set includes a luxury glass teapot, a silver scoop spoon and 3 bags of fresh loose leaf tea or infusion of your choice. You can find out Christmas Gift Sets here.